Autumn colors in the vineyard behind contrast of the plum colored trees in the foreground. 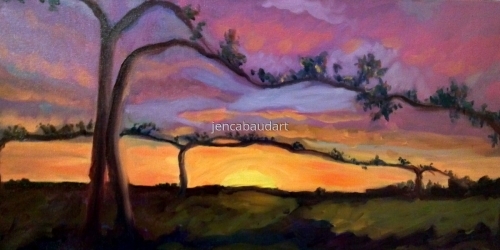 Original oil painting is 12" x 24" in an oak frame ready to hang. 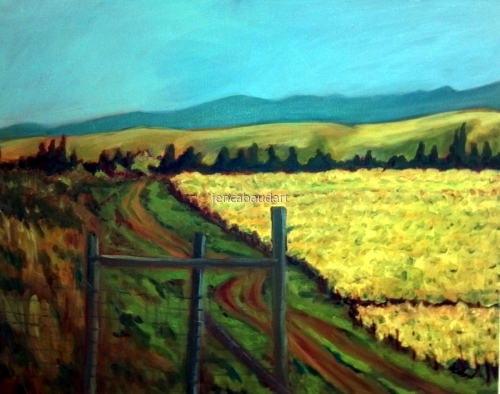 An Original Oil painting on 18x36 Gallery Canvas has the brilliant colors of the local Sonoma Vineyard and the lovely country atmosphere that is indicative of this area. Sunset view of new vines growing in the purple evening. The glow touches the landscape as the yellow sun sinks. Ready to hang. 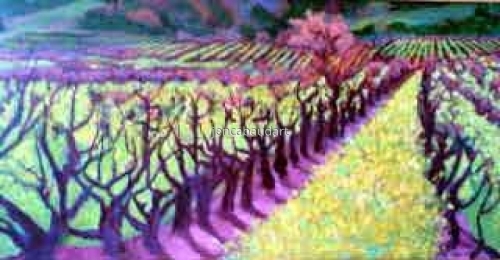 Original oil painting depicting the bold yellow colors in the vines at the winter season. 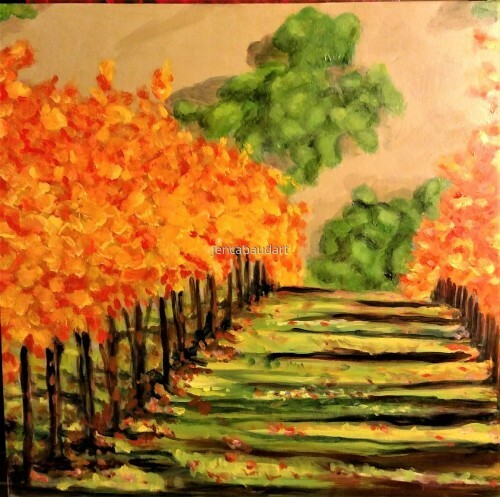 Contrasted against the deep purple vines it makes a dynamic landscape. Ready to hang. 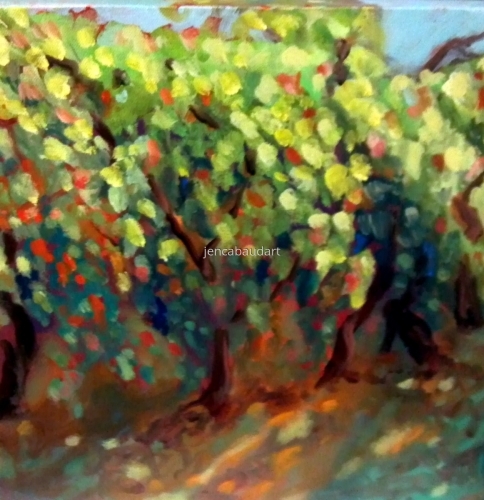 An original oil painting of a gracious old vine in this soft and pastural scene. Ready to hang. 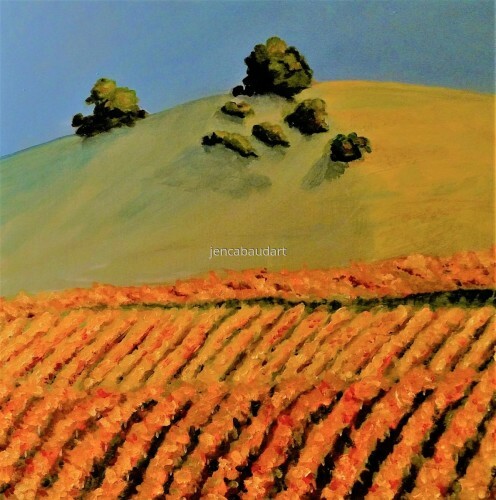 A vineyard scene from a local Sonoma ranch this painting is ready to hang and will grace any decor with it's vibrant colors. 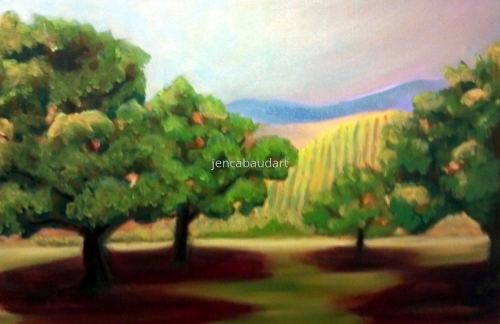 An original oil done on gallery canvas. 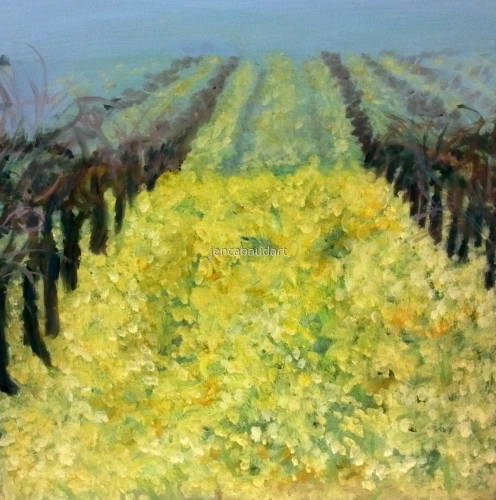 Original oil painting of winter vineyard with mustard in a misty morning. 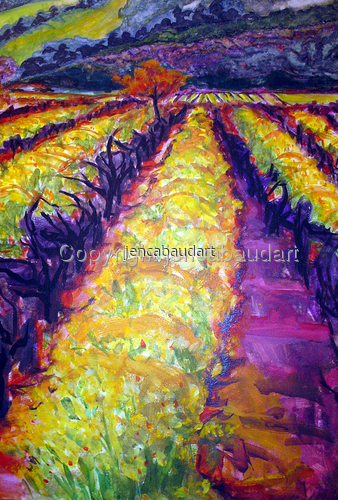 Beautiful yellow mixed with deep magenta of the vines. Painting is on board and ready to hang. 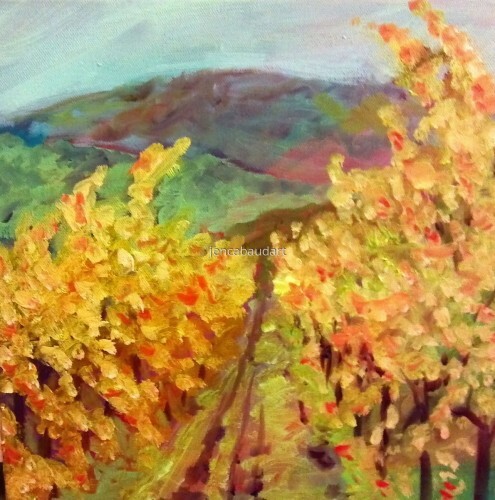 An original oil painting of detail on vines with ripe fruit ready to pick. Original oil painting on gallery canvas ready to hang. 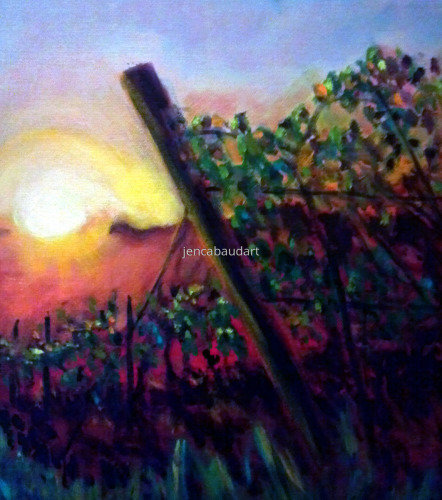 Gorgeous sunset vineyard scene. 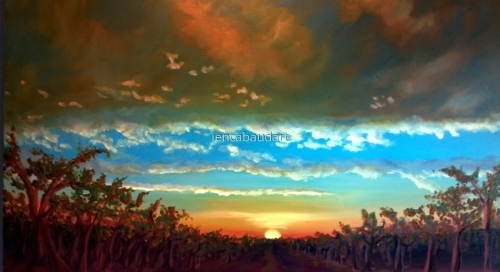 A moody sky over the glowing sunset lit vineyards in the wine country. Beautiful fall hues were vibrant this year in the vineyards of Sonoma Valley. This painting is oil on board, ready to hang and signed on the back. Mustard graces the rows of sleeping vines in a winter vineyard in Sonoma. This painting is oil and framed in a maple contemporary frame. 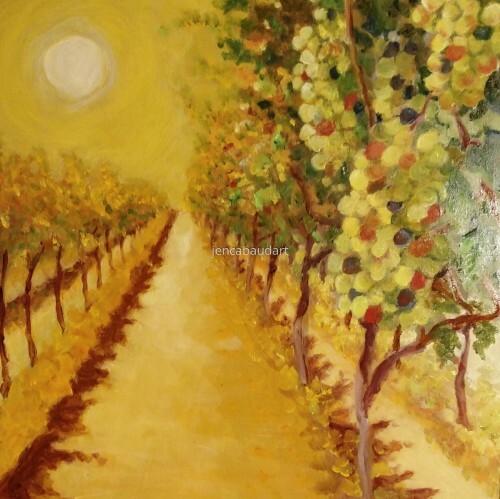 An original oil painting on canvas of a compiled vineyard scene. This is a dynamic work even though it is only 10"x20". 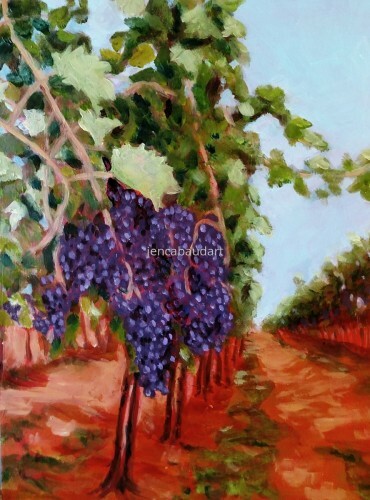 An original oil painting with ripe purple grapes, hanging from Sonoma vines....ready to pick. Painting is 12 x 12 and wired and ready to hang. 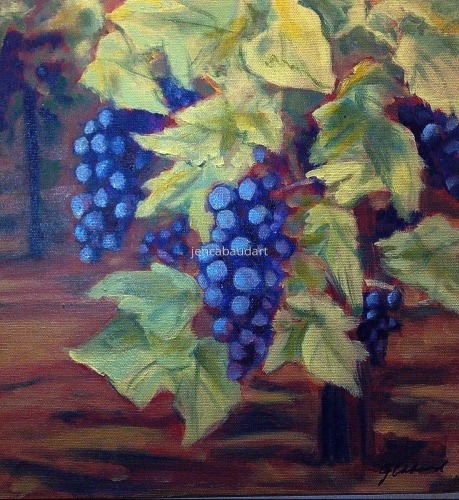 An original oil painting with ripe purple grapes, hanging from Sonoma vines....ready to pick. Painting is 12 x 12 and wired and ready to hang. Sundown is coming on the local vineyard. 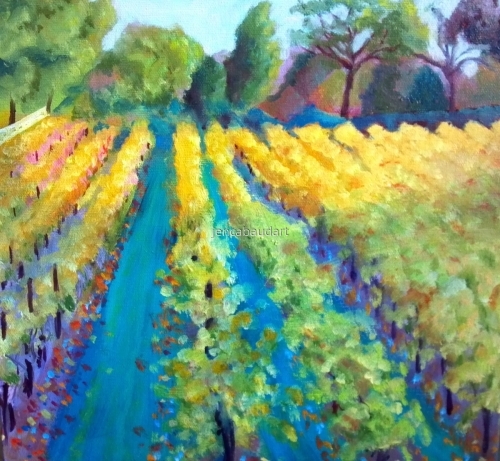 An original oil painting with ripe grapes, Sonoma vines....ready to pick. Painting is 12 x 12 and wired and ready to hang. 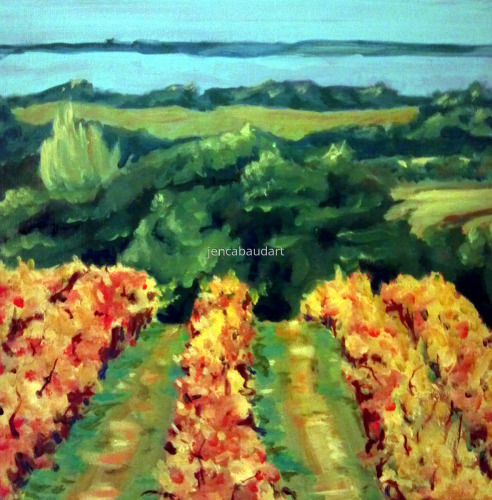 An original oil painting with Carneros Vineyards, Sonoma vines....ready to pick. Painting is 24 x 30 and wired and ready to hang. Oil on canvas ready to hang. 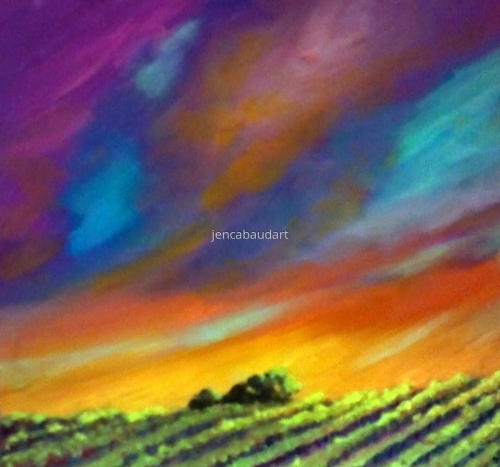 Glowing sundown back lights an oak in this vineyard scene. 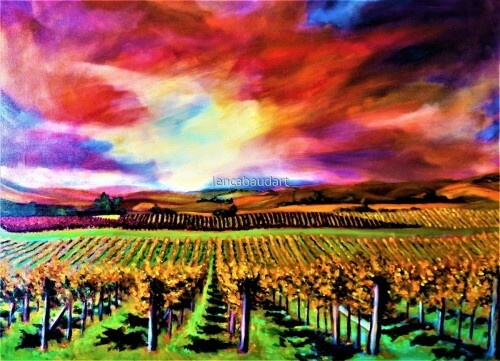 This original oil painting of a vineyard landscape with a colorful sunset sky is wired and ready to hang. Ripe grapes hang on golden vines waiting for Sonoma harvest! 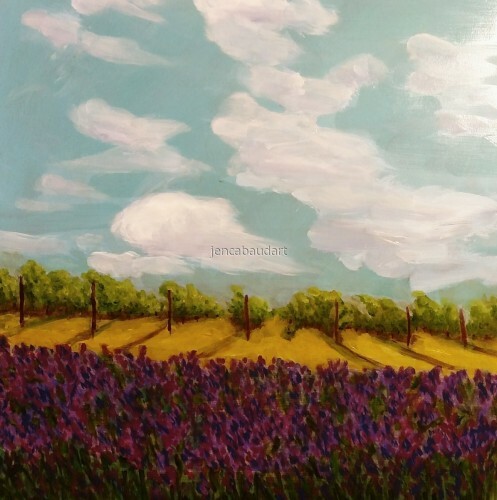 This painting is an original oil painting on gallery canvas that does not require framing as it is painted on the edges as well. Ripe grapes hang ready for picking on a close up vine in Sonoma Wine Country! 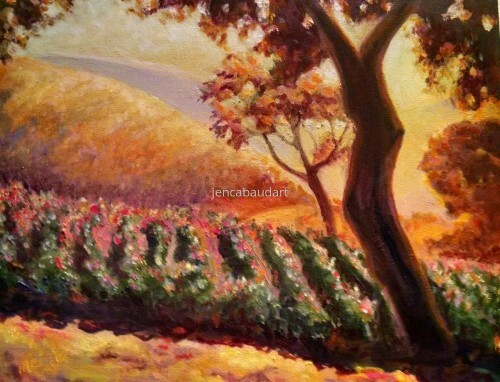 Original oil painting of local vineyard in late afternoon light on board and ready to hang. 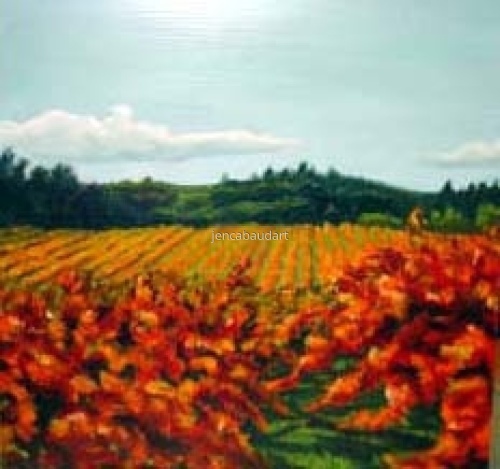 Original oil painting on canvas of local vines in the fall season. Ready to hang. Stunning dramatic sky over a late season vineyard in Sonoma wine country. During the fall of 2017 we had fires raging in the area adding dark and ominous clouds to the skies. This is the artists interpretation of the landscape.